Joseph Fraser attacked his girlfriend after she hid his car keys so he wouldn’t drink-drive, a court heard. File photo of a courtroom. A DUBLIN BUSINESSMAN who kicked a mother-of-two in the head with his steel-toe shoe during a vicious assault has received a four-year sentence. Dublin Circuit Criminal Court heard that Joseph Fraser (42) had been dating the woman for a few months when he drove to her home drunk. Detective Garda Robert Collins testified that the injured party hid Fraser’s car keys to prevent him from driving again and causing an accident. Fraser got angry at this and began punching the woman in the ribs, face and head, in an attack which carried through the hallway and kitchen and into the back garden. 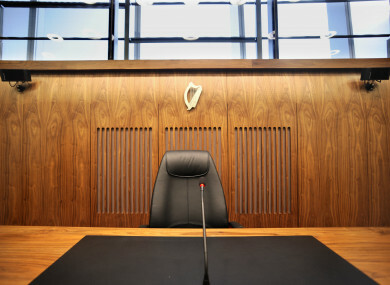 The father-of-six, of Mount Eagle Drive, Leopardstown, pleaded guilty to assault causing harm at Foxborough Downs, Lucan, Dublin, on 19 September 2017. He has two previous convictions for drunk driving. Collins told Ronan Kennedy BL, prosecuting, that the woman tried to lock herself into the dog cage in the garden to escape the assault. Fraser dragged her back to the house by her hair, rammed her face off sliding doors and kicked her in the head with his steel-toe shoe. Today Judge Melanie Greally noted the “extreme violence” perpetrated by Fraser on his ex-partner. She imposed a four-year sentence with the final 18 months suspended, taking into consideration his guilty plea, excellent work history and his recent efforts to deal with his alcohol problems. Tom Neville BL, defending, had submitted that a “confluence of events” had occurred in his client’s life leading up to the attack, including his Fraser Oil company failing, two relationship breakdowns and him seeking refuge with alcohol. That does not cut much in the way of mustard as a mitigating factor in a case of extreme violence. Collins said the injured party, in describing the attack, told gardaí that “on a scale of one to 10, the pain was 11”. The woman eventually fled to a neighbour’s home to call gardaí. After the assault, she realised her house key, car key, mobile phone and some personal items were missing. Collins handed photos to Judge Greally showing the woman’s injuries, including two black eyes and images of where Fraser had kicked the kitchen door in half. He said Fraser had been arrested on the day for an unrelated public order matter and that during interview he claimed the injured party had attacked him. The woman in her victim impact statement said she now rarely goes out to socialise and suffers flashbacks to the assault in her home. She said the bruising to her leg lasted for months and that some loose skin on her eye had only recently gone away. She described how the attack had also impacted her children and her parents. Collins agreed with Neville that the guilty plea had saved further distress to the woman and that her physical wounds had since healed. Neville submitted that Fraser wished his letter of apology be conveyed to the injured party. Counsel outlined his client’s extensive working background and how he had set up Fraser Oil with his father. Neville said his client found himself in a “bad, bad place”, but acknowledged that his personal circumstances and serious mental health issues did not justify his actions. Judge Greally suspended the final 18 months of the sentence on condition Fraser completes victim focused work and engages with MOVE (Men Overcoming Violent Emotions). If you have been affected by domestic abuse and would like to talk, contact the below numbers or visit SafeIreland.ie. Email “Man rammed girlfriend's face off door and kicked her in head with steel-toe shoe”. Feedback on “Man rammed girlfriend's face off door and kicked her in head with steel-toe shoe”.